The K, k, Kpa and Kpb antigens were reported in 1946, 1949, 1957 and 1958 respectively. Kell system antigens are fully developed at birth and the K antigen is very immunogenic. Anti-K, anti-k, anti-Kpa and anti-Kpb have been implicated in Haemolytic Transfusion Reactions and Haemolytic Disease of the Newborn. The reagent will cause indirect agglutination (clumping) of test red cells, that carry the corresponding Kpa antigen, in the antiglobulin phase of testing. No agglutination generally indicates the absence of the corresponding Kpa antigen. Lorne Polyclonal Anti-Kpa blood grouping reagent is prepared from human serum diluted in a sodium chloride solution containing macromolecular potentiators and bovine albumin. 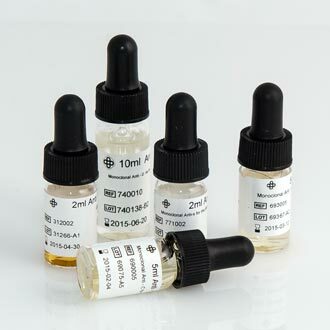 Each reagent is supplied at optimal dilution for use with indirect Coombs tube and gel card techniques without the need for further dilution or addition.